Jamey D. Grooms is our Pastor. He was saved at the age of eight, surrendered to the call to preach at 16 and has served in various ministries since that time. He has been in full time ministry since 1995. 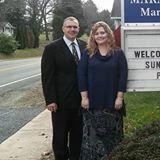 We extend a warm welcome to you to visit Maranatha Baptist Church to hear God's Word proclaimed.